Have you bought the book yet? You can get hold if it so easily – whether you are into Kindle or paperback, from me direct, from shopping online or in a good old-fashioned book shop. Whether you’ve read the book or have yet to, let me tell you that for me, becoming a published writer is, in unashamed cliché speak, a dream come true. Yet, as with most experiences, being an author is a mixed one… Not least because my inner egoist has been at constant war with its’ evil twin, my inner critic. What my cerebral twins war about, is this book of mine, i.e. ‘Peachey Letters – Love Letters to Life’; a glorious collection of missives sent to the blend of people, past and phenomena that have shaped my psyche. Peachey Letters looks at the darkness and levity of life and how, woven through out it, when I look for it, I will always find the positive force of love, lighting my way. But I’m NOT the book’s only reader, so I know that the book has both its’ lovers and also its’ detractors – not least my (only) brother, who really cannot understand its’ appeal. As there are some very personal stories shared about our family, I wanted him to read it before it was published. So he did and he found it ‘selfish’. This comment made me smile. I love how a family member can just cut to the chase and anchor your floating ego solidly to the earth. And I agree, it really IS a selfish book; yet by sharing my stories, I found I was touching a chord with other people’s experiences and as a result am able to entertain, educate and enervate so many others, as well as myself. I’ll admit it – my inner egoist loves the praise and the limelight and so I have to remind my inner critic that great feedback is, in fact a good thing, to be received gracefully, and not batted away like an annoying fly (which is my natural tendency). Before I put all this out there, I cringed and was scared that I would be judged for being egotistical, narcissistic and seen to be suffering from mid-life crisis triviality. Yet as a coach I know that such thoughts stem from an archaic self-protection mechanism of negative thought patterns, that ironically are in place to keep me small and therefore ‘safe’. “A very thought-provoking read. I love the way that Sandra has woven stories into this book that will encourage you, motivate you, and touch you at the deepest level. It will tug on your heartstrings, bring you to tears, but most of all, it will inspire you to live your best life. Highly recommended.” ~ Karen Williams. I am a life coach so will imbue all I do with a navel gazing, life improving spin. And all of this is presented in my own lyrical and poetical prose, combined with my daft sense of humour, too. You can read it straight through or you can dip in to it daily, as there will be a Love Letter to suit just about every mood. My Peachey Letters book has featured in national journals, including Psychologies magazine and The Lady. I’ve chatted about it on the BBC and it has been featured in the local press, with me, as a local lass (in several locations) ‘done good’ many times over. Needless to say, my happy egoist will tell you that it is an ideal Christmas present – either as a gift or for yourself. The nuts of bolts of buying it, are that you can order it from your local bookshop or buy it online from any global website that sells books. If you buy it directly from me, I can sign it for you, if that is your bag – here are all the details. You can buy it too from independent sites / stores such as Hive and from Amazon (Prime) – both in electronic (Kindle) form and paperback. And if you buy from The Book Depository site, you can get it delivered, anywhere in the world, free of postage. From me and The Twins. You sit down and tune in to the on-going soap opera… It’s the next episode of a set of serialised stories that you have been watching… How will all these posed situations resolve – who will: kiss who, win the argument, suddenly move abroad, solve the dilemma, break a heart, find themselves in deathbed hospital scene, go crazy, have an affair or a baby, steal, cheat, find out they are adopted, loathed or lusted after??? But still these have all happened to me or my loved ones in just the last few months… So why watch invented stories, when it’s all happening out there any way..? As a child I would spend hours in front of the television. I turned it on when I got home from school and then it was turned off, many hours later at the bed time of whoever was the last person to go to bed, usually my mother or my brother. In those antiquated distant days, if the TV set wasn’t turned off before the programmes ended (in a much shorter schedule than the 24 hours we have today), somewhere around midnight, then the picture would shrink away to a bright dot in the middle of the screen and instead of pictures and voices; dancing darkness and a static crackle would emanate, eventually building to a shrill warning whistle, evincing from the google box – a demanding patrician authoritarian, commanding you to turn it off and silence it; so that you would quietly retire to bed, and it could sleep blackly and silently. That is until it was awoken the next day, by pushing in a big bland button to snap it slowly back to fizz and crackle, thence progressing to recognizably tangled patterns of wide dots which shaped themselves to a wide molecular clarity of character, voice and scene. My mother and I, in our little world, centred on our urban terrace, shared our lives with various characters, cast in soap operas. The radio would be on in the kitchen all day, (tuned to Radio 4) and the TV on all evening. I loved the world of radio, and still do… There were 2 serial soap operas back then, with the spoken word taking my mind’s eye into other people’s kitchens and churches; listening to their conversations and mild BBC adventures. Whilst we lived and breathed through our own lives and happenings, my mother would then sit on the sofa in the early evening, after dinner, and watch her regular fix of ITV idiocy, a televised soap opera. Even as a small child I felt the sets to be flimsy and the pretexts of the character’s lives and loves to be even more so. That daily dose of 30 minutes of commercial drama bored me. But later I grew up and into them and as a teenager, sat and watched them alone, as after dinner, instead of putting her feet up, my mother went out to work, as a cleaner. They became a kind of addiction, a daily habit of ingesting tacky sharings and stories. With time came more TV channels, which led to more soap operas. As the world changed and television became increasingly, ridiculously lurid, I could stand the sexual intrigues and peddled misery no more and simply stopped watching them. Instead of living through other’s lives on the TV box, I escaped to live my own dramas and intricate emotional serialisations. All around me, my friends had their own minor and major dramas, but otherwise went on to have seemingly normal, stable existences. But not me, never me – instead I stepped towards and stumbled from job to job, from relationship to relationship. There were constant changes and crises, a rise and fall of fortune, from rags to tears. For years and years I acted out on amateur stages, screaming and singing my way through fairies and villainesses, slapping my thigh and crying crocodile tears, performing mini dramas in draughty church halls and tiny theatres. Later in life, on the road to becoming a coach, with support and self-analysis, I started to see the patterns of my life and tried to re-draw them and so invent a new character for myself. I dressed differently, I talked more positively and changed the script. But to my chagrin the story did not end the way I planned, instead, just like all the soap operas I had imbibed as a child, there would be a cliff hanger of an ending, begging to be the beginning of the next, crazy episode in my serialised life. 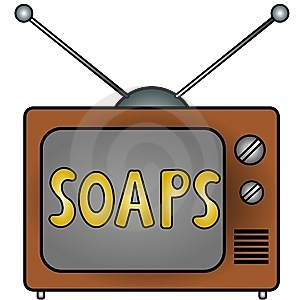 One of the things about soap operas though, is that there are only so many plots that can play out before they come around again, as recycled repeats – a balled up Sunday omnibus of intrigue and what will either become self loathing or learning. So I have decided to learn and to turn that learning towards helping others sift through their lives, and their stories and strategies. So I listen and I coach and I support, and so it all moves on through time. It is something that I excel at, helping others, and in a gorgeous giving cycle, being the audience for other people’s dreams and dramas, means that I get to resolve and grow along with all of my clients. To my amazement though, the Sandra Soap Operas are still playing out, with unexpected plot twists that I never could have foreseen, even now. In the world of coaching many will tell you that you are the cause of all the drama in your world, that you manifest all the sighs and the symptoms. I worked with that premise for a long time, taking control of my destiny and changing it. Well that was the intended plot, so I have always been surprised when my will and work still did not alter time and tide. And next to me stand my faithful friends, with one in particular who has recently gone through whole box sets of happenings in her life, looping on escalating, ridiculous repeat, to a crescendo of change to which we still cannot see an end. She crashed and burned for a while, but is now walking through the ashes, and living day to day rather than in the past or future, and it is something that I have taken on board – that sometimes you just need to let the plots of life wash over you, and mark your time instead in milliseconds of happiness or meaningfulness, rather than concern yourself with a neat, filmic ending. Unlike the rolling soap opera genre, the film instead has a definitive ending, if not by plot, then by virtue of the end credits, calling the story to a stop. And maybe I like films better because they have that finality, that conclusion, rather than the drudge of repetitive story lines replaying forever on. The film will work to the finale – to the kiss, to the Bollywood song and dance routine, to the victory; or to the death. So whilst I have so often cursed fate or DNA or the odd synergies of life which still surprise me half a century in; I’m now just letting the story continue to unfurl, without knowing the ending. I’ve made my peace with the Writer, I keep moving forward and plotting new story lines, whilst also returning to old favourites and cosy routines. In life, at times, it is right to take action, yet right now, it is time to bide my time and to simply watch the screen. So maybe, it just may be, that I am still a soap opera kind of girl after all, and in amongst all the cliff hangers – for me and my loved ones, there is still laughter and pleasure and immeasurably, there is always love – both defining and illuminating all my stories. And that my friend, is the end of this particular episode. With love and lazy attention.